The original idea for the character selection screen as released by Dave Wilson’s Twitter account. One of many examples as to how WoW evolved into the game players have known and loved over the past 13 years. When World of Warcraft rose to success after the game’s initial launch in 2004, it was no surprise that it’s player base grew so quickly. That being said, developers and the gaming community alike could not have predicted just how many players WoW would eventually pull in. Over its first year, the number of adventurers in the world of Azeroth spiked to nearly 6 million and continued to grow. With the game revolutionizing the MMO genre on top of delivering quality gameplay and increasing content, the act of supply and demand became more relevant than ever. 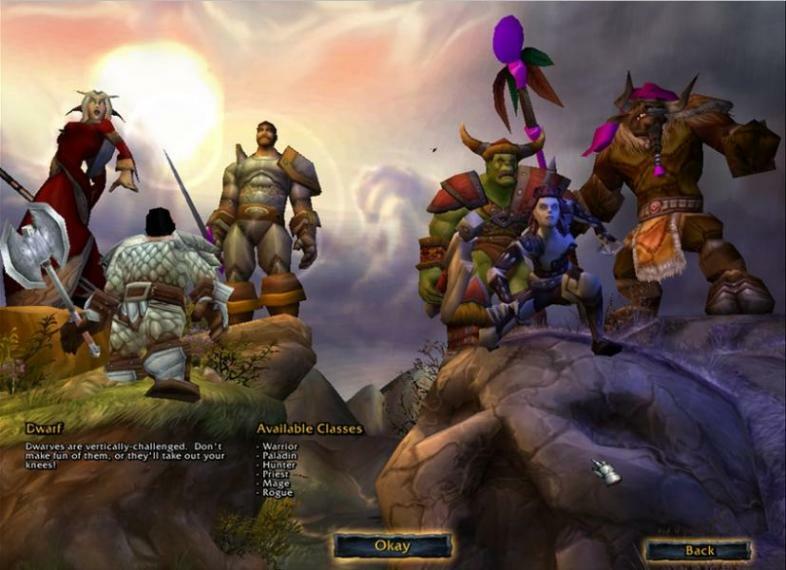 One of the original screenshots for the vanilla version of World of Warcraft that was featured on the physical, boxed edition of the game. As more and more players clamored to join the Horde or Alliance and begin their journey to loot and glory, Blizzard followed suit almost perfectly. Updates to the original version of the game soon arrived in the form of dungeon and raid content, world bosses, consistent tweaks and class balancing, bug fixes, as well as the standard battleground system still primarily in place today. These early features and updates, now looked back over the game’s 13 years, gave some of WoW’s oldest players their fondest memories. With the game’s overall pace and structure vastly different during that time compared with what it is today, skill and group coordination were at its highest level. As subscriptions continued to rise, so did Blizzard’s revenue. With more revenue, and now becoming one of the most popular games on the market, World of Warcraft’s development hit heights few other MMO’s have touched. With so many players to appease as they worked their way through the already available content, the constant call for new updates to the world they loved was often voiced. A birds-eye-view of the new zone Hellfire Peninsula -the first zone players took when they crossed through the Dark Portal and into the 2007 release of The Burning Crusade. The first of these was the Burning Crusade. A brand new continent to explore, shiny new loot to collect, never explored dungeons and raids, two new playable races and the first ever flying mounts -the game was taking its only next logical step in progression. As the content continued to pour in, so did the number of active subscribers. With the Burning Crusade’s 2007 release, the player base had already cracked the 8 million mark and showed no signs of slowing down. With more players, meant more money which lead to even more content and popularity. In 2008, the 10 million subscriber number was broke and followed suit with the next expansion Wrath of the Lich King later that year. Following as the previous development cycle had, new expansion-focused content continued until December 2010 and Cataclysms release. Right around this time is when Blizzard reported its highest ever active subscription amount -12 million. Still staying true to the $15 a month system, during that time Blizzard saw roughly $180 million a month in revenue. While the game has been slipping in numbers since then, with its original 2004 release, Blizzard created something truly groundbreaking and self-sustaining and has the proof to show for it. With its tried and true development cycle and creating a truly engaging gameplay experience unlike any other, fellow MMOs have been trying to recreate what worked so well in the past amongst the world of Azeroth and beyond. Beard-clad, pirate-at-heart storyteller from the Pacific Northwest.